Blizzard’s suddenly got a weird obsession with this “Two people controlling the same thing at the same time” mechanic. Last year they announced StarCraft II’s new Archon Mode, where two players control the same group of units. This year? 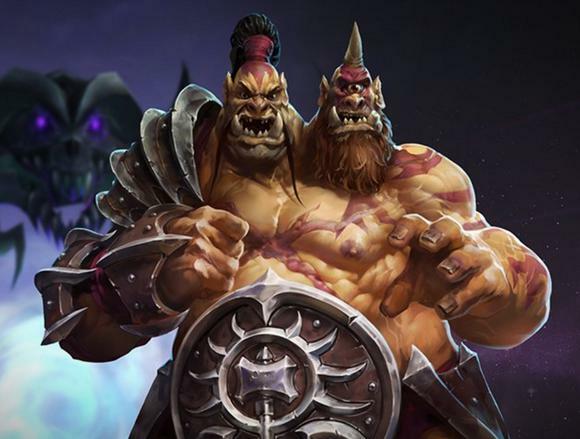 Cho’gall, one of the newly announced Heroes of the Storm characters, which is also—you guessed it—controlled by two people simultaneously. I mean, he has two heads so it’s thematically appropriate. Cho’gall will be available through pretty novel means. Everyone at BlizzCon this year or who purchased the Virtual Ticket will get Cho’gall for free. Others will need to party up with a Cho’gall owner and play two games to obtain the Hero. Blizzard also showed off a crazy new “Arena” mode, which looks like Mortal Kombat’s awesome Test-Your-Luck slot machine madness except MOBA-ized. Hearthstone got (surprise!) another expansion announcement, this one subtitled The League of Explorers. The primary new mechanic is “Discover.” Blizzard’s description: “You’ll treasure the opportunity to dig up cards and select the one you need the most!” A real description: When you play a Discover card you’ll have the opportunity to put one of three other cards in your hand. The catch: The three cards you get to choose from are not necessarily cards in your deck. There’s also a Golden Monkey card that replaces all your cards with legendaries for a match. It’s a bit interesting to see Blizzard stressing the importance of Hearthstone e-sports while also making the game more and more luck-based. Those seem (to me at least) mutually exclusive, and the new cards sound like they’ll introduce even more balance issues. But if you’re interested, you can start playing when the first bit drops on Thursday. Lastly, World of Warcraft. It wouldn’t be BlizzCon without it. We already knew quite a bit about the new expansion, Legion, considering Blizzard unveiled it over the summer. It’s basically Burning Crusade Redux. And that’s it from BlizzCon 2015. No Diablo and new game announcements, unfortunately, but a lot of stuff slated for early 2016 from the looks of it.